The Arizona Oil & Gas Conservation Commission today approved permits (#982-986) for Southwest Exploration to drill five exploratory wells to evaluate potash deposits near Holbrook. The wells will be drilled on State Trust Lands. These will be the first tests of the potash resources in three decades or more and the first to be drilled under modern standards for reporting and documenting results. The Holbrook basin deposits have been drawing international attention in the past year or so as the price of potash soared from $50-100 per ton to $500 - 1,000 per ton as global demand for fertilizers surged. An AZGS report released last fall [right, isopach map], calculated potash resources at 682 million metric tons to 2.27 billion metric tons. Mesa Uranium was granted exploration permmits in January, why is this particular news posted? 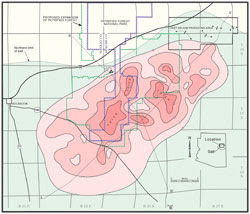 Southwest Exploration got well drilling permits, the first exploratory wells in 30 years or more into the potash deposit. Mesa Uranium announced "exploration permits" with the State Land Dept, but they have not sought permits to drill any wells. Since the deposit is all in the subsurface, the issuance of well permits is an important development. OK that does help explain the news. If Southwest proves up a reserve that is economical what are the chances that they could mine either underground or solution mine given the proximity to the PFNP? thanks for the help! I really enjoy your blog. I think the location of the park in the middle of the deposit is potentially one of the biggest obstacles. About 1/4 of the potash underlies the park proper. Even more underlies the extended park boundaries, although Congress never appropriated funds to buy the lands within the larger boundaries. You can speculate that private land owners may be putting a higher dollar value on those lands now with billions of dollars of potash underlying them. The companies we've talked to consider both solution mining and underground mining potentially viable options. A lot will depend on modern assays. Ironically, the presence of the park could result in more surface disturbance that otherwise, if the deposit has be mined in blocks on either side of the park, instead of a single, unified resource. However, the deposit is large enough, with different owners, that multiple mines would be developed regardless. This is all predicated on the original resource assessments being confirmed and the economics of this deposit compared to others around the world. Countdown to state government shut-down?